1. Preheat the oven to 120°C, gas mark ½. Line a baking sheet with baking parchment. Blend the vanilla seeds in a bowl with a spoonful of the sugar to distribute them evenly. Whisk the egg whites in a thoroughly clean bowl until soft peaks form. Gradually whisk in the sugar a spoonful at a time, whisking well between each addition. Whisk in the vanilla sugar then sift in the cornflour and stir well. 2. 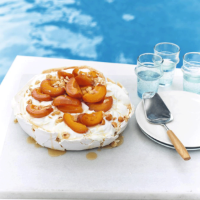 Spoon the meringue out onto the baking sheet and spread to a circle about 22cm in size. Bake for about 1¼ hours until the meringue feels crisp and dry. Leave to cool completely. 3. Meanwhile, put the apricots, 50g sugar and 150ml cold water in a saucepan and heat very gently, stirring frequently for about 10 minutes until the apricots are softened but not falling apart. Lift the fruit out with a slotted spoon and leave to cool. Reduce the juices in the pan over a high heat until thick and syrupy. 4. Whisk the cream in a bowl with the remaining 2 tbsp sugar until soft peaks form. Stir in the yogurt. Transfer the meringue to a serving plate and scatter with half the nuts. Pile half the cream and apricots on top, then repeat with the rest of the cream and apricots. Scatter with the remaining nuts. Drizzle with the apricot syrup just before serving.